THE political history of Punjab after 1947 has been greatly influenced by the vicissitudes and policies of the Shiromani Akali Dal. The credit for the partition of Punjab is claimed by the Shiromani Akali Dal. The historians of the Shiromani Akali Dal have called the present Punjab and Haryana as a gift of the Akali Dal to India. The Indian National Congress that came to power after 1947 would not form a coalition with the Akali Dal but was ready to en-bloc admit all Akali leaders into the Indian National Congress. Quite a few of them reached the top positions of political power in India like Sardar Hukam Singh, Sardar Swaran Singh and Sardar Buta Singh and many others. However, at the grassroot level both the parties did not insist on merger, nor did the Congress leaders find anything objectionable in having with them leaders who had been branded as communal before they joined the Congress. Every time the Akali Dal leadership went over to the Congress, new leaders standing for the Akali Dal ideology were thrown up by the grassroot units of the party. They would espouse an exaggerated concern for the Sikh identity and highlight cases of discrimination against the Sikhs even when in many cases it was known that the grievance or alleged transgression against the Sikh sentiments had an element of make-believe in it. There was a vacuum in the Sikh leadership for sometime after the 1957 merger of the Akali Dal with Indian National Congress. Master Tara Singh, the sole Akali Dal leader for decades, had not opposed the merger but he did not join the Indian National Congress. He soon set about reviving the Akali Dal mainly on the plank of fighting for achieving a rightful place for Punjabi language, which later changed to establishment of the Punjabi Suba. This was a period when the leadership vacuum of the Akali Dal came to be filled by the joining of Justice Gurnam Singh. He had graduated from the Forman Christian College of Lahore and he was called to the Bar from the Middle Temple, London. He was a brilliant sports man and a champion athlete of Panjab University. He had captained the university hockey team. He was appointed judge of the High Court in 1950 , and he retired in 1959 moving thereafter to the Akali Dal. The birth of the Akali Dal was from the milieu of the gurdwara reform movement and the national freedom movement under the leadership of Mahatma Gandhi. The Akali Dal, therefore, had a national agenda and a particularistic agenda of presumed Sikh interests. Gurnam Singh came to the Akali Dal at a time when the Akali commitment for the national agenda was very weak and the commitment for the presumed Sikh interests was very strong. The Akali leadership changed for the first time after decades. Master Tara Singh got replaced by Sant Fateh Singh. The Akali Dal under Master Tara Singh gave an impression that they were fighting for the establishment of a Punjabi- speaking state in order to achieve a Sikh majority state. Sant Fateh Singh gave a call that his objective was only to have a Punjabi- speaking state established like other linguistic states in India. This secular stand of Sant Fateh Singh was something close to the heart of Gurnam Singh. It was the progressive ideology of Gurnam Singh which made Sant Fateh Singh to decide to project Gurnam Singh as a leader of the legislative wing of the Shiromani Akali Dal. He was the leader of the Opposition in the Punjab Legislative Assembly from 1962 to 1967. This was the crucial period when at last the demand for Punjabi-speaking state got conceded. Gurnam Singh was able to build an acceptability for himself and for the Akali Dal among the national leaders, which helped in diluting resistance to the formation of the Punjabi-speaking state. He became Chief Minister of Punjab heading a coalition government after the elections in 1967. His was a unique coalition government where the Leftists and Rightists both joined to support his government. It seems that the grassroot leaders of the Akali Dal who were interested in petty advantages and favours from the local administration fell foul of Sardar Gurnam Singh because he would not interfere in the administration at the behest of the local Akali jathedars. This brought about an estrangement between Gurnam Singh and Sant Fateh Singh. Combined with other factors of political instability and internal dissension within the Akali Dal, the government of Gurnam Singh could not complete its term. Indira Gandhi, whose Congress party was instrumental in pulling down the government of Sardar Gurnam Singh, yet recognising his merit, appointed him as the Indian High Commissioner to Australia. Gurnam Singh had ambitious plans for the Punjabis in Australia but before those plans could take shape, he died in an air crash in 1973. The problem that Gurnam Singh faced as an enlightened leader of the Akali Dal has been a perennial problem with the leaders of the party. A set of Akali leaders go for radicalising the Sikh masses in order to create their constituency among them. The idiom they use for this purpose is the idiom and tradition harking back to the 18th century when the Khalsa was on the top in Punjab. This idiom does not easily permit them to adjust and accommodate the compulsions and requirements of running a modern secular state. So far no Akali Chief Minister has been able to complete his term of office of five years. Badal had to face a fall when he could not carry the Jan Sangh with him over the extension of the jurisdiction of the Guru Nanak Dev University to DAV institutions of Jalandhar. Barnala could not achieve the balance between maintaining law and order in the state, which is a primary responsibility of the state government, and the freedom to be permitted to the radicals and extremists among the Sikhs. Badal is again face-to-face with the contradiction of the Akali governance where the peace and order in the state has to be the first priority of the state government, and if the interests of the public so require, the particularistic Sikh agenda has got to be placed on the back-burner. This is a situation which is inherent in the reality that prevails in Punjab. The decades of terrorism in Punjab have taught the people that peace can prevail if the majority community, i.e. 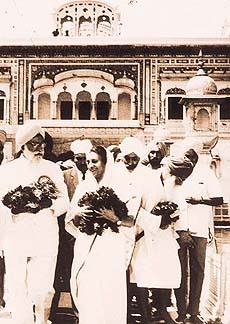 the Sikhs, are free from the feeling that some of their vital interests were being jeopardised by the government in power. It was this feeling which made the Punjabis vote for the Akali Dal in the last elections. Badal seems to understand it well. Therefore, he has always been emphatic that peace of the Punjab will not be allowed to be compromised at any cost. However, the fear that Punjab is on the brink of a precipice again seems to be exaggerated. Punjab at present does not have an ideologue, a charismatic leader or even a demagogue capable of playing on the sentiments of the Sikhs to lead them to a path of destruction. The massive support for Badals faction among all the factions of the Akali Dal when he faced the manoeuvring of the Akali Takht and went ahead to forge an alliance with the Bharatiya Janata Party is indicative of the fact that the Sikh masses are no longer prepared to permit a destructive emotional blackmail. It is well to remember that the problems that Badal is facing are of the same type that came up before Gurnam Singh, whose birth anniversary fell on February 25.